Happy 2018, if the statute of limitations has not yet run out on such greetings. What will the new year bring? When it comes to prognosticating, historians are probably no better than any others. As to the past, however, we would be remiss to overlook that it has been a half-century since the year 1968–arguably the annus mirabilis of the American city. Let me explain. The assassination of Martin Luther King on April 4th of that year triggered riots in cities across the country, the culmination of a sequence that had begun five years earlier in Harlem, Rochester and Philadelphia. The rioting in ’64, followed by Watts the following year, continued with such regularity each summer that that the phrase “long hot summer” began to imply that if the thermometer rose to a certain point, then one ghetto or another might explode. But the riots did end, more or less, in 1968. (The later ones such as Liberty City (1980) and Rodney King (1992) were sufficiently distant in time as to appear distinct from the long hot summers even though the ostensible causes were similar.) Why the rioting ended in ‘68 remains an open question. But if few had predicted the beginning or end of the riots, fewer still predicted that the arson, abandonment, job and population losses that followed in the seventies and eighties would prove so devastating that most American cities would never fully recover. It should be kept in mind that despite the turmoil of the sixties, American cities were then relatively strong: the majority of African American families in 1960 were headed by two adults; despite the mass arrests during the riots, soaring crime rates, and a raging heroin epidemic, incarceration rates were declining. Then too, reformers remained confident that slum clearance, public housing construction and community-based anti-poverty programs might renew and revive city life. But the King assassination followed by that of Robert Kennedy and the fearful rioting and racial divisiveness of 1968 dissipated the positive outlook of reformers dating back to Jacob Riis. The profound loss of confidence in the future of cities also arose because a troubling question was now being raised: were cities needed to sustain economic growth? At the Bureau of Labor Statistics, Regional Commissioner Samuel M. Ehrenhalt reported that after the number of jobs in New York City peaked during 1968-69, the city’s economy plunged into what he called “free fall.” One sixth of the city’s employment base, 600,000 jobs, was wiped out in seven years. Throughout history those living in the countryside had ventured into cities looking for work; but when work in cities disappeared, so might the residents. 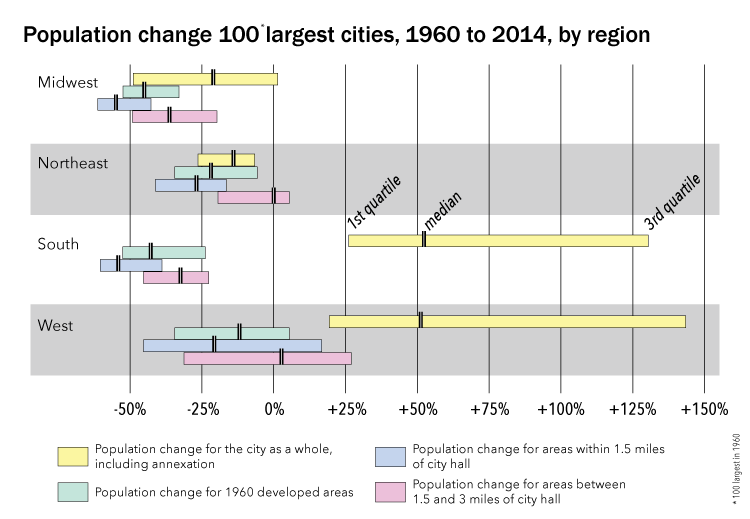 Between 1970 and 1980, NYC lost more than 800,000, a population substantially greater than the entire city of Boston. But New York’s ten-percent loss seemed modest compared to declines in places with less resilient economies (and with fewer immigrants to take the place of the departed.) Baltimore, D.C. and Cincinnati lost 20 percent, 1970-1990; St. Louis, Detroit, Cleveland, Pittsburgh, and Buffalo, lost 30 percent during the same period. American cities had been thinning out since the fifties but nothing like such losses had ever been seen before. Meanwhile as Cleveland, Detroit and Buffalo appeared to be in free fall, Houston, Dallas, Phoenix and other Sunbelt cities (their high murder rates to the contrary notwithstanding) appeared to flourish. It was understood that the warmer weather, cheap air conditioning, and massive federal defense and aerospace outlays to the Sunbelt explained the mass migration south and west. But the inevitable comparison between the rising Sunbelt and falling Snowbelt cities was misleading in an important respect. Unable to annex surrounding suburbs, the Snowbelt cities were confined by tight boundaries that had not expanded much since the horse and buggy era. Meanwhile Sunbelt cities had annexed so much territory after World War II that their boundaries defined not just cities, but burgeoning metropolitan suburbs. 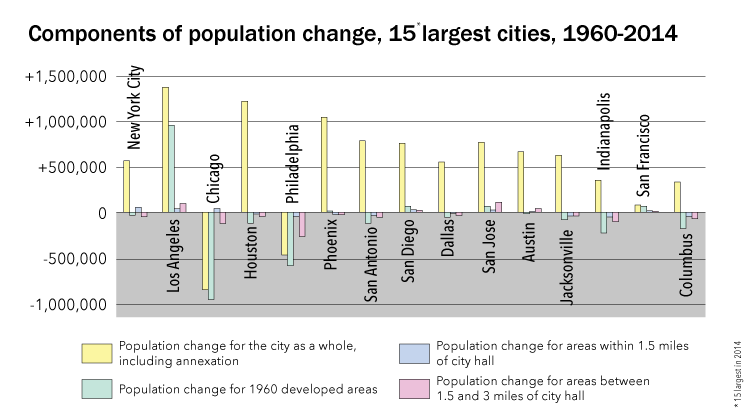 Compare St. Louis at 66 sq miles, Cincinnati (80), and Detroit (140) to Dallas (340) Phoenix (517), and Houston (600). If those Sunbelt cities had maintained their 1940-1950 boundaries, then they too would have been labeled as dysfunctional ghettos surrounded by prosperous suburbs. I have dubbed ‘68 annus mirabilis, but this cheerless screed seems more suggestive of annus horribilis. Still the mighty John Dryden dedicated his epic Annus Mirabilis to the City of London, then going through an especially rough patch. By 1666, Dryden’s “year of miracles,” the plague, which had began the year before, had wiped out upwards of 100,000 of London’s half-million residents. Then came the fire of September 2-5, 1666 which destroyed the better part of the city. The miracle, it was said, was that God had not wiped out the whole enterprise. What then of the miracle of 1968? On June 5th of that year, two months after the King assassination, Robert Kennedy, campaigning for the Democratic presidential nomination, was gunned down in the Ambassador Hotel in Los Angeles. The summer brought rioting at Grant Park and on Chicago’s the south and west sides. Amidst this frenzy, it was easy to overlook that something momentous had taken place: on June 30, 1968 the Immigration and Nationality Act became effective. Passed by overwhelming bi-partisan majorities three years earlier, the new the act had dispensed with half-century old quotas favoring north European emigration; instead emigrants from Asia, Africa, the Caribbean and Latin America were being welcomed. With little fanfare over the next half-century, the newcomers transformed the U.S. into a remarkable multi-cultural nation; they settled all over the country but especially in cities, including places sometimes written off as uninhabitable. Those cities may not have re-gained their former glory, but the newcomers contributed a necessary measure of stability. The American city was no longer in free fall. It could have been worse. Annus mirabilis indeed. Jim Wunsch teaches urban and educational history at Empire State (SUNY). He formerly served as non-partisan staff to the New Jersey Assembly’s Municipal Government Committee, as Associate Director of the Regional Plan Association and taught social studies at Monroe, Smith and Truman high schools in The Bronx.